By Raymond Tu, MD, Progressive Radiology, Falls Church, VA; United Medical Center and The George Washington University School of Medicine and Health Sciences, Washington, DC. Dr. Tu is Chairman, Department of Radiology, United Medical Center, Washington, DC, Partner at Progressive Radiology, Falls Church, VA, and Associate Professor of Radiology, The George Washington University School of Medicine and Health Sciences, Washington, DC. A 46-year-old woman presented for evaluation of a breast mass. The initial mammogram (Figure 1) identified a focal asymmetry, which was evaluated by sonography and determined to be a cyst. Calcifications at the inferomedial quadrant were compressed and a repeat tangential view (Figure 2) identified the calcifications to be benign, with no evidence of malignancy BI-RADS 2 (arrows). Small dermal calcifications may be confused with malignant calcifications. 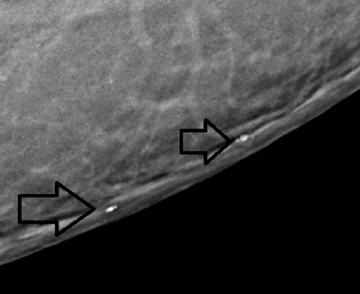 Their location on the skin surface rather than within the breast is key to proper diagnosis.1 Dermal calcifications are benign and should not be confused with malignancy. 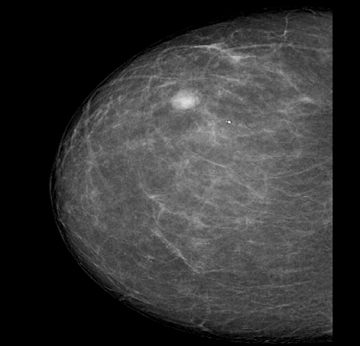 Despite findings of a focal asymmetry in the initial mammogram, a repeat tangential view, acquired on a MicroDose digital mammographic system, identified the calcification as a dermal calcification and, therefore, benign, concluding that there was no evidence of malignancy BI-RADS 2. Geiss CS, Raza S, Birdwell RL. Continuing medical education: Distinguishing breast skin lesions from superficial breast parenchymal lesions: Diagnostic criteria, imaging characteristics, and pitfalls. Radiographics. 2011;31:1959-1972; doi:10.1148/rg.317115116. Breast cyst and dermal calcification. Appl Radiol.